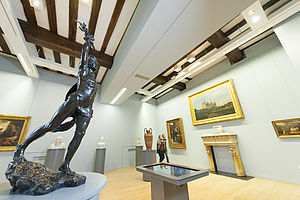 As is true for many regional museums, the earliest collections of MUDO – Musée de l'Oise were created in the late 19th century. But its first 70 years of enrichment were severely impaired by the destruction of more than three-quarters of its collections in the bombardments of World War II. From that time, one extraordinary collection of medieval Picardy sculptures was preserved. After the war, the museum had to re-establish a clear identity and eloquent image. Successive curators and directors thus organized our collections around large, consistent ensembles of artworks: Italian baroque paintings, all the works of Thomas Couture, the Boudot-Lamotte bequest, the Delaherche collection, the Art nouveau collection, the Pissareff collection, etc. This far-sighted and effective acquisition policy has of course been based on purchases and loans as well as on gifts, donations and bequests by generous sponsors. See a selection of 20 works from the collections. In 2015, after several years of renovations that combined heritage development and contemporary design, the museum introduced a magnificent selection from its 19th century collection, right in the centre of the episcopal palace. This new tour route takes the visitor on a journey through a selection of works dedicated to the landscape, French forests and Italian lakes, from the confines of the Orient to Danish winters in the form of paintings by Camille Corot, Alfred Sisley, Paul Huet and Prosper Marilhat, to name just a few. The museum then decided to spotlight the decorative paintings of Alexis-Joseph Mazerolle and Pierre-Victor Galland in particular, along with some magnificent ceramics by Jules-Claude Ziegler. Presented in the former bishop's reception hall, the impressive, unfinished painting by Thomas Couture, L'Enrôlement des volontaires de 1792, renovated with help from sponsors, is again showing its full 45 m2 alongside numerous preparatory studies. The visit ends under the gaze of the Virgin by Jean-Auguste Dominique Ingres, a selection of painted sketches and sculpted models expressing the revival of religious art.